Letters and Papers, Foreign and Domestic, Henry VIII, Volume 15, 1540. Originally published by Her Majesty's Stationery Office, London, 1896. 190. Charles Duke of Suffolk to Cromwell. Hearing that the King intends to sell Buttley and Tangham, of which Wm. Naunton, treasurer of my house, is now farmer, (fn. 1) I beg you will intercede that he may purchase them. Kayhoo, 11 Feb. Signed. 191. Ralph Sadleyr and Sir Thomas Wharton to the Council in the North. This day arrived letters for you (enclosed) from the King of Scots, in answer to yours touching the commutation of Doctor Hylyarde for Cockbanke Rutherford, a Scottish rebel. As the matter partly touches my (Ralph Sadleyr's), charge, as now sent by the King to the King of Scots, and as I, Sir Thomas Wharton, am one of your number, we opened them. Like them not and advise the Bishop to inform the King and Council with diligence. Newcastle, 11 Feb. Signed. 192. William Le Gras to Lady Lisle. I received at Paris your letter, and have since come here, where I found le Sieur Guilliaume Portier and gave him a little packet containing six crapes and some white taffetas asked for by my lord Deputy, with the loups cerviers, which I send to him. Rouen, 11 Feb. 1539. Hol., Fr., p. 1. Add. 193. John Owen to Lord Lisle. I beg you to write to the Master of the Maison Dieu, surveyor of the King's works here, Mr. Thos. Wingfield, comptroller, and Mr. Antony Autchere, paymaster of the same, that I may continue in the making and working of the King's ironwork; for I perceive that the said paymaster is displeased with me without any cause, except asking for such works as I have made. I am admitted to the said works by the King's smith, Harry Romaynes, who has the King's patent, and has deputed me to use the working of iron and I have the King's said patent from him with all the power to him granted. Dover, 12 Feb.
194. Anne Rouaud (Madame de Bours) to Lady Lisle. I beg you not to take it ill that I have not written for so long. It is long since I have been at Guischard, and I have been very busy. Two days ago I came to see Madame de Riou, who has been ill for six or seven weeks. While I have been here, Monmorancy has written that he is sending the bearer to ask you to help him to obtain some poodles (barbetz) for the crossbow or hackbut. It would give me great pleasure if you would send me a large greyhound. Please send news of yourself by the bearer. Pont de Remy, 12 Feb. Signed. Fr., p. 1. Add. : A Calais. A commission for wheat and malt for Calais. The establishment of the castles and blockhouses. The caulking and trimming of the King's ships. The finishing of the King's household. The final determination of the Spears. The statutes (fn. 2) of the blockhouses and how that every officer shall behave himself in his office. 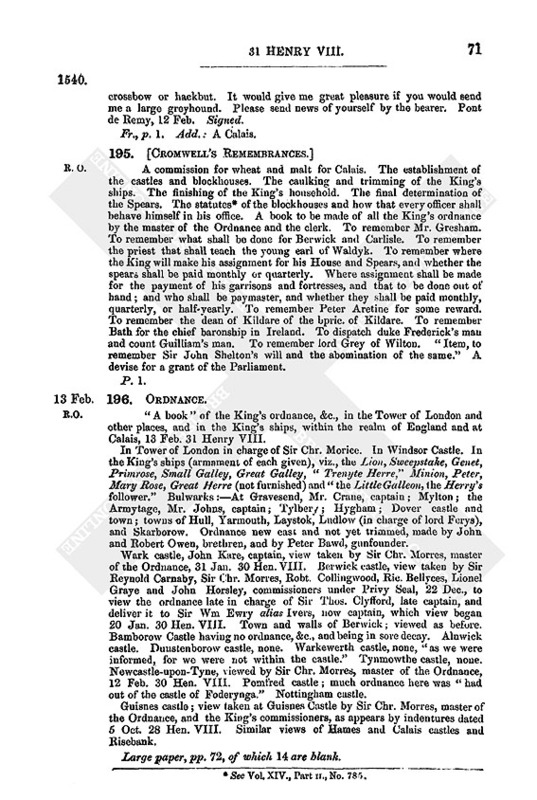 A book to be made of all the King's ordnance by the master of the Ordnance and the clerk. To remember Mr. Gresham. To remember what shall be done for Berwick and Carlisle. To remember the priest that shall teach the young earl of Waldyk. To remember where the King will make his assignment for his House and Spears, and whether the spears shall be paid monthly or quarterly. Where assignment shall be made for the payment of his garrisons and fortresses, and that to be done out of hand; and who shall be paymaster, and whether they shall be paid monthly, quarterly, or half-yearly. To remember Peter Aretine for some reward. To remember the dean of Kildare of the bpric. of Kildare. To remember Bath for the chief baronship in Ireland. To dispatch duke Frederick's man and count Guilliam's man. To remember lord Grey of Wilton. “Item, to remember Sir John Shelton's will and the abomination of the same.” A devise for a grant of the Parliament. “A book” of the King's ordnance, &c., in the Tower of London and other places, and in the King's ships, within the realm of England and at Calais, 13 Feb. 31 Henry VIII. In Tower of London in charge of Sir Chr. Morice. In Windsor Castle. In the King's ships (armament of each given), viz., the Lion, Sweepstake, Genet, Primrose, Small Galley, Great Galley, “Trenyte Herre,” Minion, Peter, Mary Rose, Great Herre (not furnished) and “the Little Galleon, the Herry's follower.” Bulwarks:—At Gravesend, Mr. Crane, captain; Mylton; the Armytage, Mr. Johns, captain; Tylbery; Hygham; Dover castle and town; towns of Hull, Yarmouth, Laystok, Ludlow (in charge of lord Ferys), and Skarborow. Ordnance new cast and not yet trimmed, made by John and Robert Owen, brethren, and by Peter Bawd, gunfounder. Wark castle, John Kare, captain, view taken by Sir Chr. Morres, master of the Ordnance, 31 Jan. 30 Hen. VIII. Berwick castle, view taken by Sir Reynold Carnaby, Sir Chr. Morres, Robt. Collingwood, Ric. Bellyces, Lionel Graye and John Horsley, commissioners under Privy Seal, 22 Dec., to view the ordnance late in charge of Sir Thos. Clyfford, late captain, and deliver it to Sir Wm Ewry alias Ivers, now captain, which view began 20 Jan. 30 Hen. VIII. Town and walls of Berwick; viewed as before. Bamborow Castle having no ordnance, &c., and being in sore decay. Alnwick castle. Dunstenborow castle, none. Warkewerth castle, none, “as we were informed, for we were not within the castle.” Tynmowthe castle, none. Newcastle-upon-Tyne, viewed by Sir Chr. Morres, master of the Ordnance, 12 Feb. 30 Hen. VIII. Pomfred castle; much ordnance here was “had out of the castle of Foderynga.” Nottingham castle. Guisnes castle; view taken at Guisnes Castle by Sir Chr. 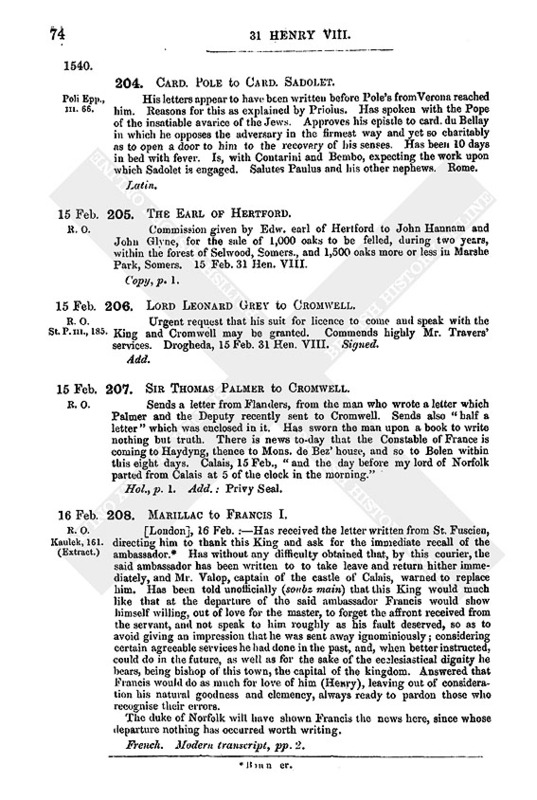 Morres, master of the Ordnance, and the King's commissioners, as appears by indentures dated 5 Oct. 28 Hen. VIII. Similar views of Hames and Calais castles and Risebank. Large paper, pp. 72, of which 14 are blank. 197. Thomas Fairfax to Cromwell. Has, of the late abbot and convent of the surrendered monastery of St. Mary's, York, the farm of the manor of Welles in Appleton, in the county of the city of York, for term of years whereof 29 are yet to come, at 13l. 13s. 4d. yearly, and has farmed it of the late abbot's predecessors for 30 years. The said manor of Wolles, with other lands in Gartheforde worth 4l. a year, is now come to the King's hands. Desires to purchase them, and begs Cromwell's favour. 13 Feb. Signed. 198. Sir Thomas Wharton to Lord Maxwell. 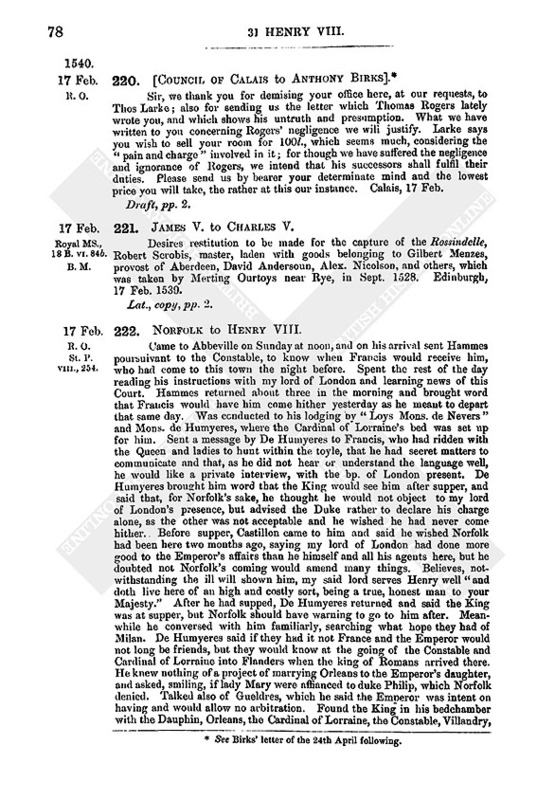 Has written, in the King's name, for delivery of divers rebels who have been “ressett” in Scotland, naming the houses wherein they were “ressett,” and lately for one Doctor Helzerd, the King's rebel, but has had no answer. The rebels of Tendall are “resetted” in Ledysdalle in the houses Wharton named. Can do no less than demand redress according to the peace. Andrew Bell, whom I purposed to deliver to your Lordship, as I told you at our last meeting at Black Banke, according to the King's command to me, has escaped from Carlisle castle. He is in Eschedall, under your rule. He went from Carlisle to his uncle Thome Bell at Grettnaw, thence to Humph. Bell's, Andrew's brother, in Middleby, thence into Eschedalle to John Baytes (i.e. Beattie's) house of the Lang Hollm, and then to Rowe Baytes and Nicol Baytes. He hurt his shoulder in leaping the castle wall; but has since stollen in Scotland. I beg you to take him and return him to me. Marvels the rebels “resetted” in Ledysdale are not delivered. Desires answer by bearer. Kerlisle, 13 Feb.
199. Deputy and Council of Ireland to Henry VIII. ONeill, being at peace, sent for some of the Council to parley with him at Carryk Bradaghe beneath Dundalke, on 22 Jan. last; and Mr. Travers, master of the Ordnance, and the Chief Justice were sent. They were at Dundalke that day; when Ferdoragh, son to ONeill, made a raid upon Fuys, Phelim Row's country. Travers wrote of this to the Deputy at Trym the same day; and he set out and rode all night, and arrived at Dundalk at 8 a.m. on the 23rd, leaving Mr. Gryffyth and John Abrereton to follow. Rested till 5 p.m., and then rode all night towards Dungannon, ONeill's chief town, 34 long miles; Griffith and John Abrereton (his father was diseased with his leg) painfully following. Would have surprised ONeill, but the guides mistook the way, and day broke when they were still five miles from Dungannon. Continued there burning and destroying the country six days. This shows what surety is in the peaces of Irishmen, many of whom besides ONeill take open part with the Bishop of Rome against the King. Beg that the army may be better paid; and ask for 100 Northern horsemen, at once. Their own horses are worn out, and ONeill, ODonell, ORaylie, and such Irishmen can each furnish more horsemen than the Deputy, the power of the earl of Ormond excepted. Ordnance and cart horses almost spent. Ask for 30 cart horses. The musters have not been taken as ordered, because since the army landed they have been occupied; but on Tuesday next musters shall be taken of all but 200 archers, who are with Mr. Brereton and Mr. Gryffyth in Munster aiding Ormonde and James Fitz Maurice. Drogheda, 13 Feb. Signed: Leonard Gray—John Alen—Wyllyam Brereton—George Dublin.—Edwarde Gruffyth —Willm. Brabazon—Gerald Aylmer, justice—Thomas Luttrell, justice —Robert Cowley—John Travers. 200. The Council of Calais to Cromwell. The letter printed in State Papers viii., 252, is of the year 1537. See Vol. XII. Part i., No. 417. 201. 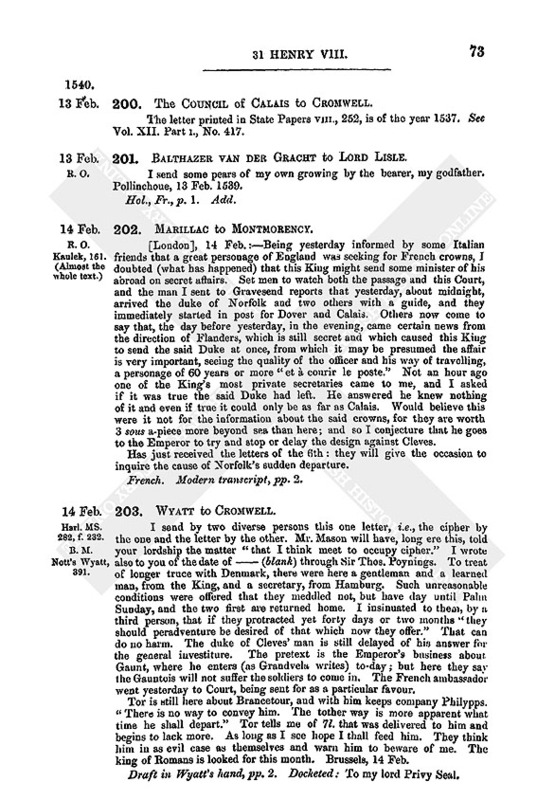 Balthazer van der Gracht to Lord Lisle. I send some pears of my own growing by the bearer, my godfather. Pollinchoue, 13 Feb. 1539. [London], 14 Feb.:—Being yesterday informed by some Italian friends that a great personage of England was seeking for French crowns, I doubted (what has happened) that this King might send some minister of his abroad on secret affairs. Set men to watch both the passage and this Court, and the man I sent to Gravesend reports that yesterday, about midnight, arrived the duke of Norfolk and two others with a guide, and they immediately started in post for Dover and Calais. Others now come to say that, the day before yesterday, in the evening, came certain news from the direction of Flanders, which is still secret and which caused this King to send the said Duke at once, from which it may be presumed the affair is very important, seeing the quality of the officer and his way of travelling, a personage of 60 years or more “et à conrir le poste.” Not an hour ago one of the King's most private secretaries came to me, and I asked if it was true the said Duke had left. He answered he knew nothing of it and even if true it could only be as far as Calais. Would believe this were it not for the information about the said crowns, for they are worth 3 sous a-piece more beyond sea than here; and so I conjecture that he goes to the Emperor to try and stop or delay the design against Cleves. Has just received the letters of the 6th: they will give the occasion to inquire the cause of Norfolk's sudden departure. French. Modern transcript, pp. 2. I send by two diverse persons this one letter, i.e., the cipher by the one and the letter by the other. Mr. Mason will have, long ere this, told your lordship the matter “that I think meet to occupy cipher.” I wrote also to you of the date of — (blank) through Sir Thos. Poynings. To treat of longer truce with Denmark, there were here a gentleman and a learned man, from the King, and a secretary, from Hamburg. Such unreasonable conditions were offered that they meddled not, but have day until Palm Sunday, and the two first are returned home. I insinuated to them, by a third person, that if they protracted yet forty days or two months “they should peradventure be desired of that which now they offer.” That can do no harm. The duke of Cleves' man is still delayed of his answer for the general investiture. The pretext is the Emperor's business about Gaunt, where he enters (as Grandvela writes) to-day; but here they say the Gauntois will not suffer the soldiers to come in. The French ambassador went yesterday to Court, being sent for as a particular favour. Tor is still here about Brancetour, and with him keeps company Philypps. “There is no way to convey him. The tother way is more apparent what time he shall depart.” Tor tells me of 7l. that was delivered to him and begins to lack more. As long as I see hope I thall feed him. They think him in as evil case as themselves and warn him to beware of me. The king of Romans is looked for this month. Brussels, 14 Feb. Draft in Wyatt's hand, pp. 2. Docketed: To my lord Privy Seal. 204. Card. Pole to Card. Sadolet. His letters appear to have been written before Pole's from Verona reached him. Reasons for this as explained by Priolus. Has spoken with the Pope of the insatiable avarice of the Jews. Approves his epistle to card, du Bellay in which he opposes the adversary in the firmest way and yet so charitably as to open a door to him to the recovery of his senses. Has been 10 days in bed with fever. Is, with Contarini and Bembo, expecting the work upon which Sadolet is engaged. Salutes Paulus and his other nephews. Rome. 205. The Earl of Hertford. Commission given by Edw. earl of Hertford to John Hannam and John Glyne, for the sale of 1,000 oaks to be felled, during two years, within the forest of Selwood, Somers., and 1,500 oaks more or less in Marshe Park, Somers. 15 Feb. 31 Hen. VIII. 206. Lord Leonard Grey to Cromwell. Urgent request that his suit for licence to come and speak with the King and Cromwell may be granted. Commends highly Mr. Travers' services. Drogheda, 15 Feb. 31 Hen. VIII. Signed. 207. Sir Thomas Palmer to Cromwell. Hol., p. 1. Add. : Privy Seal. 208. Marillac to Francis I. [London], 16 Feb.:—Has received the letter written from St. Fuscien, directing him to thank this King and ask for the immediate recall of the ambassador. (fn. 3) Has without any difficulty obtained that, by this courier, the said ambassador has been written to to take leave and return hither immediately, and Mr. Valop, captain of the castle of Calais, warned to replace him. 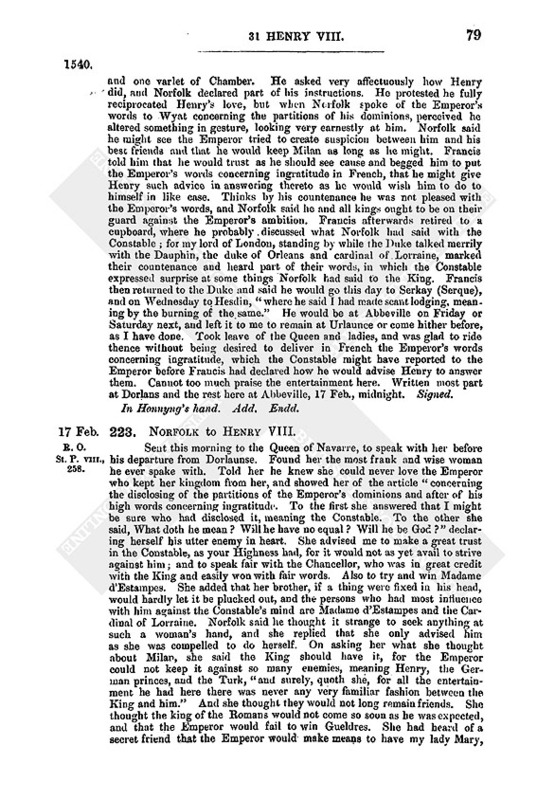 Has been told unofficially (soubz main) that this King would much like that at the departure of the said ambassador Francis would show himself willing, out of love for the master, to forget the affront received from the servant, and not speak to him roughly as his fault deserved, so as to avoid giving an impression that he was sent away ignominiously; considering certain agreeable services he had done in the past, and, when better instructed, could do in the future, as well as for the sake of the ecclesiastical dignity he bears, being bishop of this town, the capital of the kingdom. Answered that Francis would do as much for love of him (Henry), leaving out of consideration his natural goodness and clemency, always ready to pardon those who recognise their errors. The duke of Norfolk will have shown Francis the news here, since whose departure nothing has occurred worth writing. [London], 16 Feb.:—You will see by what I write to the King the desire of those here that their ambassador should depart with the King's good countenance. This would be a singular pleasure to the personage (fn. 4) who has given me the intelligence (l'advis) contained in the private letter enclosed, and who begged me to make a second request to the King which it seems more suitable to insert here. It is that people here complain somewhat that their ambassadors in France are often lodged far from the King's person (especially when the King is not at the good towns, but, as he oftenest delights to be, in “lieux serrez et peu logeables”), so that they cannot pay their court and expedite their affairs, and, moreover, strangers come to think them held in small account and their amity cooled, especially as the French here are lodged first after the King— as indeed was done to me all the time I was at the late progress. And therefore they would desire that the marshals of the lodgings should be commanded to lodge their ministers better, “affin qu'ilz entendissent sur ce poinct le bon plaisir et intencion du Roy,” as heretofore by other letters of mine you will have learnt. Now that the duke of Norfolk is there, please remind him of Rochepot's affair, which he understands very well. It is he who, with you, ought to elect the third deputy, if we accept the course offered, and he has assured me he would consent to any personage you wished. 210. Sir Richard Ryche to the Auditor of the Suppressed and Surrendered Lands in London. Desires him to give to the bearer the particulars of the tenements in Fleet Street, in the parish of St. Dunstan in the West, which are part of the possessions of the late house of the White Friars in London, and now inhabited by Wm. Jamys, Wm. Thomas, Henry Ley, Wm. Kerbey, John Wistendeyn, John Buck, Wm. Rigley, Johanne Drane, Ales Flaxton, Thos. Packar, and Chr. Dreye. St. Bartilmewez in Smythefeld, 16 Feb. 31 Hen. VIII. Signed. Enrolled [Close Roll, p. 3, No. 47] as acknowledged, same day, before Sampson Michell, clk., King's commissioner. 212. Wm. Brabazon to Cromwell. In favour of Cromwell's servant, Walter Pepard, the bearer) lately by Cromwell's letters preferred to the late monastery of St. Mary's next Dublin. Mellifaunt, 16 Feb. Signed. P. 1. Add. : Lord Privy Seal. 213. James V. to the Magistrates and Senate of Antwerp. Has received their letters stating that the Scotch merchants intend to give up trading with the port of Veere, and offering advantages if the King will allow them to trade with Antwerp. After consultation, has decided to allow them to trade where they please, and they will probably come to Antwerp of their own accord. Desires credence for William Tomsoun, canon of Hoochstrat. Holyrood, 16 Feb. 1539. 215. 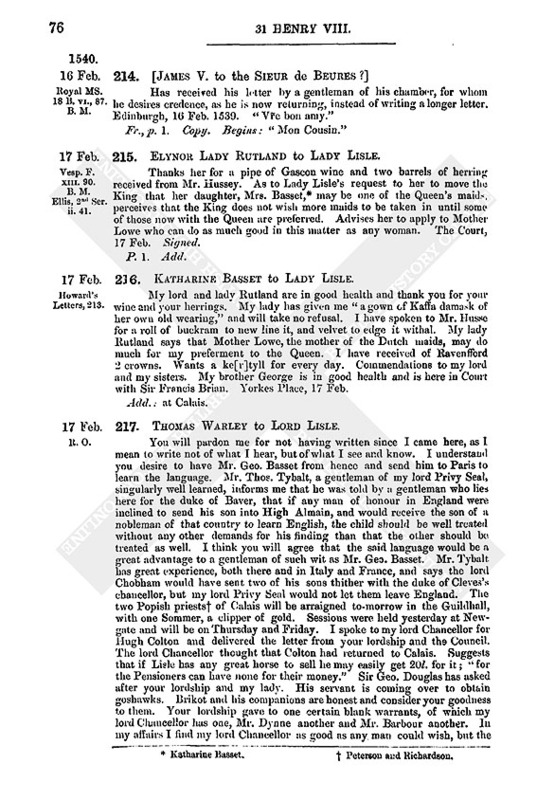 Elynor Lady Rutland to Lady Lisle. Thanks her for a pipe of Gascon wine and two barrels of herring received from Mr. Hussey. As to Lady Lisle's request to her to move the King that her daughter, Mrs. Basset, (fn. 5) may be one of the Queen's maids, perceives that the King does not wish more maids to be taken in until some of those now with the Queen are preferred. Advises her to apply to Mother Lowe who can do as much good in this matter as any woman. The Court, 17 Feb. Signed. 236. Katharine Basset to Lady Lisle. My lord and lady Rutland are in good health and thank you for your wine and your herrings. My lady has given me “a gown of Kaffa damask of her own old wearing,” and will take no refusal. I have spoken to Mr. Husse for a roll of buckram to new line it, and velvet to edge it withal. My lady Rutland says that Mother Lowe, the mother of the Dutch maids, may do much for my preferment to the Queen. I have received of Ravenfferd 2 crowns. Wants a ke[r]tyll for every day. Commendations to my lord and my sisters. My brother George is in good health and is here in Court with Sir Francis Brian. Yorkes Place, 17 Feb.
217. 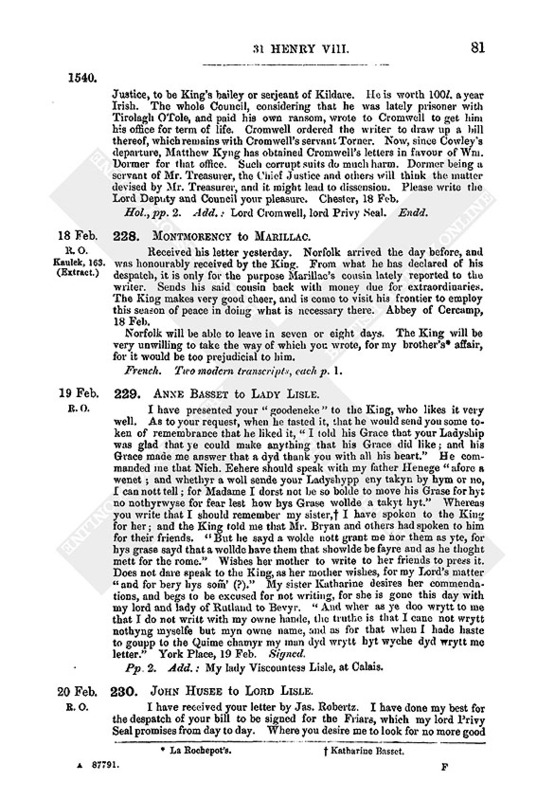 Thomas Warley to Lord Lisle. You will pardon me for not having written since I came here, as I mean to write not of what I hear, but of what I see and know. I understand you desire to have Mr. Geo. Basset from hence and send him to Paris to learn the language. Mr. Thos. Tybalt, a gentleman of my lord Privy Seal, singularly well learned, informs me that he was told by a gentleman who lies here for the duke of Baver, that if any man of honour in England were inclined to send his son into High Almain, and would receive the son of a nobleman of that country to learn English, the child should be well treated without any other demands for his finding than that the other should be treated as well. I think you will agree that the said language would be a great advantage to a gentleman of such wit as Mr. Geo. Basset. Mr. Tybalt, has great experience, both there and in Italy and France, and says the lord Chobham would have sent two of his sons thither with the duke of Cleves's chancellor, but my lord Privy Seal would not let them leave England. The two Popish priests (fn. 6) of Calais will be arraigned to-morrow in the Guildhall, with one Sommer, a clipper of gold. Sessions were held yesterday at New-gate and will be on Thursday and Friday. I spoke to my lord Chancellor for Hugh Colton and delivered the letter from your lordship and the Council. The lord Chancellor thought that Colton had returned to Calais. Suggests that if Lisle has any great horse to sell he may easily get 20l. for it; “for the Pensioners can have none for their money.” Sir Geo. Douglas has asked after your lordship and my lady. His servant is coming over to obtain goshawks. Brikot and his companions are honest and consider your goodness to them. Your lordship gave to one certain blank warrants, of which my lord Chancellor has one, Mr. Dynne another and Mr. Barbour another. In my affairs I find my lord Chancellor as good as any man could wish, but the search from auditor to auditor and from clerk to clerk of Augmentations “passeth the bp. of Rome's feigned purgatory, for it lighteth the purse, wearieth the legs, distempereth the body.” The suitor is furthest off when he thinks himself most sure, but hope assuageth a great part of his pains. Mr. Chancellor to the Queen's grace sends commendations to your lordship and my lady, and caused me to write a letter to you concerning Worthe, which I sent by Orliance, mariner. I am told my lord Dawbeney intends to take back his wife, remitting all past offences. I hope Master Basset may have no loss thereby, in his lands, hereafter. When you write to Sir Fras. Bryan, mention me that I may have some expedition. London, 17 Feb. Hol., pp. 3. Add. : Deputy of Calais. 218. Sir John Gage to Cromwell. This Tuesday, at 6 a.m., the wind being east, and fair weather, the French galleys that lay in the Camber weighed anchor and sailed westwards, so that it appears they intend to address themselves into Leuent, according to their saying. I left Rye on Friday afternoon and came to my cousin Robert Oxenbryggys house, four miles from it, where I stayed till Monday, and so to my cousin Ashburnham's, where I was at the departing of the said ships. They shot certain pieces at their departing, and I and the gentlemen in my company went to a place where we could see them under sail. At the writing of this letter they were doubling the point of Farely. I left Rye because I would have no bruit of my coming thither, and the rather if any necessity should have been I must have had my first succours out of those parts. Thinks he need not remain here longer, and will stay at his cousin Darrell's till he knows the King's further pleasure. At Gestlyng, in my cousin Ashburnham's house, Tuesday, 17 Feb. Signed. 219. Sir Thomas Wharton to Cromwell. 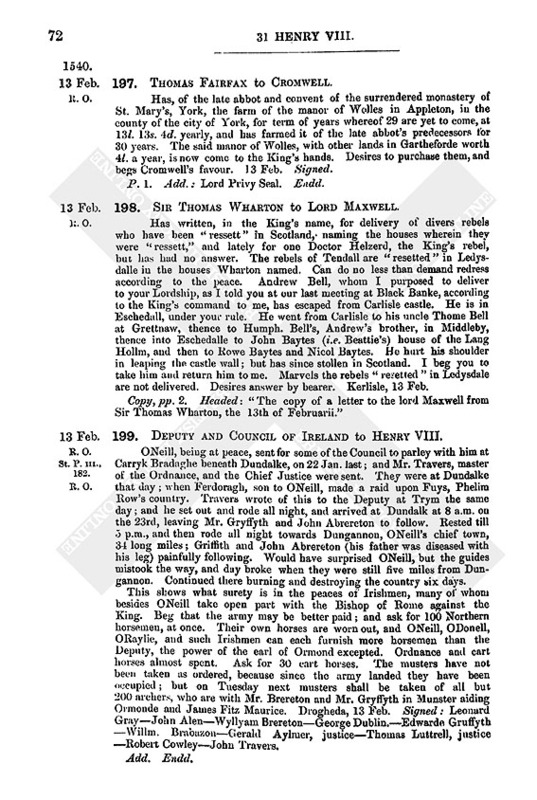 Received his letters, dated London 5 Feb, regretting the escape of Andrew Bell, traitor and rebel to Scotland, notwithstanding the King's command, by Cromwell's letters, for his deliverance; with the King's displeasure, and Cromwell's trust that Bell will be taken again “if I earnestly apply myself to avoid my folly thereby, in answering the king of Scots according to the treaties of peace.” After the submission of the traitor Bell, committed him to Carlisle castle, and, at his request, gave him liberty within the walls. Mr. Captain several times brought Bell in his company to the church of Carlisle, and the writer was urged by tenants of lord Dacres of Gilsland to take sureties for his liberty. Received then Cromwell's letters, dated Greenwich, 3 Jan., commanding him in the King's name “to deliver the traitor.” Thereupon sent his cousin Thomas Dacre to command the gaoler of the castle to put Bell and one Robt. Hetheryngton, alias Robin the Twyn, an Englishman taken for March treason, in irons. Bell feigned sickness, and the gaoler kept him with him in the porter's lodge two days longer. Then Mr. Captain, on Friday morning, 17 Jan., with divers of lord Dacre's tenants, urged Wharton to take sureties for Bell. Refused. Went that day to Westmoreland on the King's business. On Saturday night, when the gaoler was at supper in the castle, Bell escaped out of the porter's lodge, the door being open, leapt the walls of the outer ward of the castle, and escaped. Lady Wentworth herself gave him meat in the porter's lodge, saying he was most sick. Encloses copy (fn. 7) of a letter he has sent to lord Maxwell for Bell. The West Marches are quiet. Kerlesle, 17 Feb. Signed. Add. : Lord Privy Seal. Sealed. Sir, we thank you for demising your office here, at our requests, to Thos Larke; also for sending us the letter which Thomas Rogers lately wrote you, and which shows his untruth and presumption. What we have written to you concerning Rogers' negligence we will justify. Larke says you wish to sell your room for 100l., which seems much, considering the “pain and charge” involved in it; for though we have suffered the negligence and ignorance of Rogers, we intend that his successors shall fulfil their duties. Please send us by bearer your determinate mind and the lowest price you will take, the rather at this our instance. Calais, 17 Feb.
221. James V. to Charles V.
Desires restitution to be made for the capture of the Rossindelle, Robert Scrobis, master, laden with goods belonging to Gilbert Menzes, provost of Aberdeen, David Andersoun, Alex. Nicolson, and others, which was taken by Merting Ourtoys near Rye, in Sept. 1528. Edinburgh, 17 Feb. 1539. 222. Norfolk to Henry VIII. Came to Abbeville on Sunday at noon, and on his arrival sent Hammes poursuivant to the Constable, to know when Francis would receive him, who had come to this town the night before. Spent the rest of the day reading his instructions with my lord of London and learning news of this Court. Hammes returned about three in the morning and brought word that Francis would have him come hither yesterday as he meant to depart that same day. Was conducted to his lodging by “Loys Mons. de Nevers” and Mons. de Humyeres, where the Cardinal of Lorraine's bed was set up for him. Sent a message by De Humyeres to Francis, who had ridden with the Queen and ladies to hunt within the toyle, that he had secret matters to communicate and that, as he did not hear or understand the language well, he would like a private interview, with the bp. of London present. De Humyeres brought him word that the King would see him after supper, and said that, for Norfolk's sake, he thought he would not object to my lord of London's presence, but advised the Duke rather to declare his charge alone, as the other was not acceptable and he wished he had never come hither. Before supper, Castillon came to him and said he wished Norfolk had been here two months ago, saying my lord of London had done more good to the Emperor's affairs than he himself and all his agents here, but he doubted not Norfolk's coming would amend many things. Believes, notwithstanding the ill will shown him, my said lord serves Henry well “and doth live here of an high and costly sort, being a true, honest man to your Majesty.” After he had supped, De Humyeres returned and said the King was at supper, but Norfolk should have warning to go to him after. Meanwhile he conversed with him familiarly, searching what hope they had of Milan. De Humyeres said if they had it not France and the Emperor would not long be friends, but they would know at the going of the Constable and Cardinal of Lorraine into Flanders when the king of Romans arrived there. He knew nothing of a project of marrying Orleans to the Emperor's daughter, and asked, smiling, if lady Mary were affianced to duke Philip, which Norfolk denied. Talked also of Gueldres, which he said the Emperor was intent on having and would allow no arbitration. Found the King in his bedchamber with the Dauphin, Orleans, the Cardinal of Lorraine, the Constable, Villandry, and one varlet of Chamber. He asked very affectuously how Henry did, and Norfolk declared part of his instructions. He protested he fully reciprocated Henry's love, but when Norfolk spoke of the Emperor's words to Wyat concerning the partitions of his dominions, perceived he altered something in gesture, looking very earnestly at him. Norfolk said he might see the Emperor tried to create suspicion between him and his best friends and that he would keep Milan as long as he might. Francis told him that he would trust as he should see cause and begged him to put the Emperor's words concerning ingratitude in French, that he might give Henry such advice in answering thereto as he would wish him to do to himself in like case. Thinks by his countenance he was tint pleased with the Emperor's words, and Norfolk said he and all kings ought to be on their guard against the Emperor's ambition. Francis afterwards retired to a cupboard, where he probably discussed what Norfolk had said with the Constable; for my lord of London, standing by while the Duke talked merrily with the Dauphin, the duke of Orleans and cardinal of Lorraine, marked their countenance and heard part of their words, in which the Constable expressed surprise at some things Norfolk had said to the King. Francis then returned to the Duke and said he would go this day to Serkay (Serque), and on Wednesday to Hesdin, “where he said I had made scant lodging, meaning by the burning of the same.” He would be at Abbeville on Friday or Saturday next, and left it to me to remain at Urlaunce or come hither before, as I have done. Took leave of the Queen and ladies, and was glad to ride thence without being desired to deliver in French the Emperor's words concerning ingratitude, which the Constable might have reported to the Emperor before Francis had declared how he would advise Henry to answer them. Cannot too much praise the entertainment here. Written most part at Dorlans and the rest here at Abbeville, 17 Feb., midnight. Signed. In Honnyng's hand. Add. Endd. 223. Norfolk to Henry VIII. 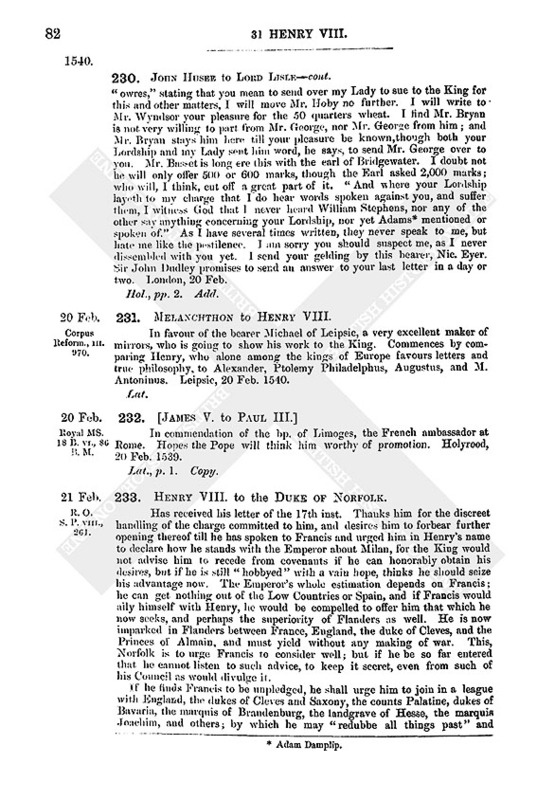 Sent this morning to the Queen of Navarre, to speak with her before his departure from Dorlaunse. Found her the most frank and wise woman he ever spake with. Told her he knew she could never love the Emperor who kept her kingdom from her, and showed her of the article “concerning the disclosing of the partitions of the Emperor's dominions and after of his high words concerning ingratitude. To the first she answered that I might be sure who had disclosed it, meaning the Constable. To the other she said, What doth he mean? Will he have no equal? Will he be God?” declaring herself his utter enemy in heart. She advised me to make a great trust in the Constable, as your Highness had, for it would not as yet avail to strive against him; and to speak fair with the Chancellor, who was in great credit with the King and easily won with fair words. Also to try and win Madame d'Estampes. She added that her brother, if a thing were fixed in his head, would hardly let it be plucked out, and the persons who had most influence with him against the Constable's mind are Madame d'Estampes and the Cardinal of Lorraine. Norfolk said he thought it strange to seek anything at such a woman's hand, and she replied that she only advised him as she was compelled to do herself. On asking her what she thought about Milan, she said the King should have it, for the Emperor could not keep it against so many enemies, meaning Henry, the German princes, and the Turk, “and surely, quoth she, for all the entertainment he had here there was never any very familiar fashion between the King and him.” And she thought they would not long remain friends. She thought the king of the Romans would not come so soon as he was expected, and that the Emperor would fail to win Gueldres. She had heard of a secret friend that the Emperor would make means to have my lady Mary, but I said I did not see you meant to bestow her there. She hoped all this would be kept secret, especially from the French ambassador there. I hope to learn from her when she comes hither on Saturday at furthest, hew Francis takes my words yesterday. She told me also that this morning on coming from the King she said she was going to speak with me, and he charged her to tell me how sincerely he loved his good brother. She answered, Sir, I trust ye will make me no liar. No, quod he, by the faith of a gentleman, I say as I think. If Francis come hither before I have answer of these from your Majesty, I shall proceed to the rest of my instructions as I see occasion. For God's sake revoke the Bishop (fn. 9) hence as soon as ye may, for he [is] marvellously hated here and will never do you good service, though I think he has good will. Bishops are bad ambassadors here, for Winchester is little better favoured than the other. Abbeville, 17 Feb., midnight. I fear the Chancellor is delayed at Amiens. Fears Cromwell will have much to do to read his letter in Honnyng's hand and more to read the other in his own. Is the most abused man living, if the French intend war to England. The French king seems to love no prince so well as the King, and though he makes fair way with the Emperor, it is for love of Milan. The Queen of Navarre advises that Henry should send some pleasant message to the Dolphin and his brother. Thinks she fears her brother will not live long, “and I think no less.” He rides daily in a litter or chair and never past a mile on horseback. “If he go, farewell Constable; and no force, for he is too much papist to do good to us. He offereth me much kindness, and I believe him but a little. My lord, revoke the Bishop (fn. 9) hence shortly and send Sir John Wallop hither.” Abbeville, 17 Feb., at midnight. Hol., p 1. Add. : Lord Privy Seal. Endd. 225. T. [Lord] Wentworth to Cromwell. I have received your letters and perceive the King's pleasure is to send you the lady Garrard (fn. 10) “in honest and secret sort.” She has been ill this three weeks and is too weak to stand; as soon as she can sit on horseback I will send her to your Lordship. I have informed her of you, and she has promised to obey you. I shall not fail to favour whomsoever you shall hereafter command me to befriend. Nettylsted, 18 Feb. Signed. 226. Walter Cowley to Cromwell. On the 15th inst., I and others came hither with the King's treasure for Ireland, and having freighted a ship intended to go to-morrow to Holy-head to await her coming. I heard from merchants that Ireland was quiet, and that the Deputy lately made a raid upon ONeil and nearly captured him. OConor and the other Irish stand in great dread. Nic. Pentney, merchant of Dublin, reported this, and now repairs to London. Chester, 18 Feb.
Hol. p. 1. Add. : Lord Privy Seal. Endd. 227. 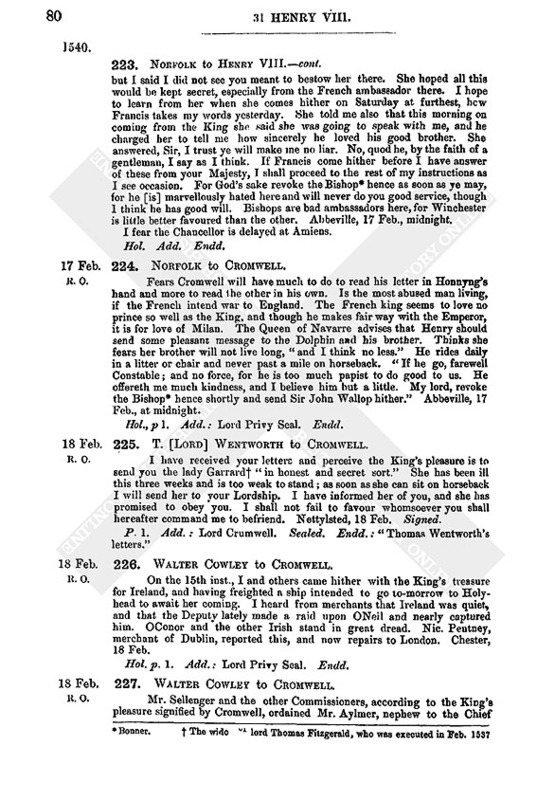 Walter Cowley to Cromwell. 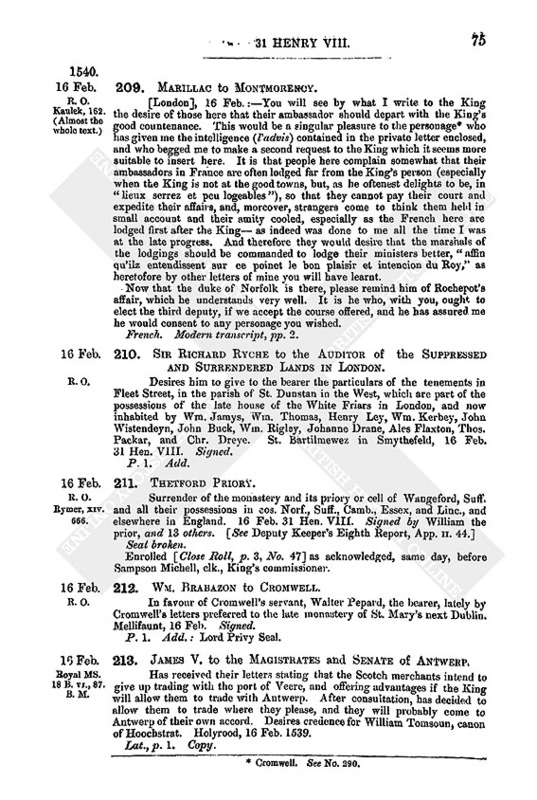 Mr. Sellenger and the other Commissioners, according to the King's pleasure signified by Cromwell, ordained Mr. Aylmer, nephew to the Chief Justice, to be King's bailey or serjeant of Kildare. He is worth 100l. a year Irish. The whole Council, considering that he was lately prisoner with Tirolagh OTole, and paid his own ransom, wrote to Cromwell to get him his office for term of life. Cromwell ordered the writer to draw up a bill thereof, which remains with Cromwell's servant Torner. 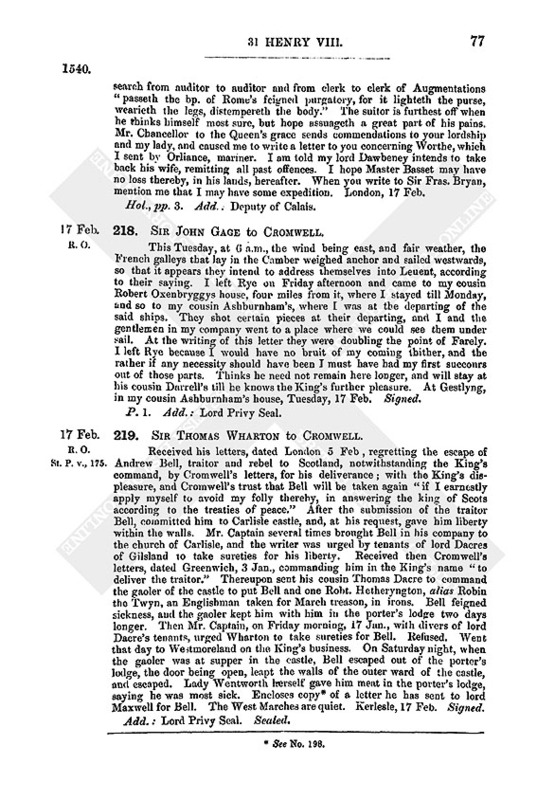 Now, since Cowley's departure, Matthew Kyng has obtained Cromwell's letters in favour of Wm. Dormer for that office. Such corrupt suits do much harm. Dormer being a servant of Mr. Treasurer, the Chief Justice and others will think the matter devised by Mr. Treasurer, and it might lead to dissension. Please write the Lord Deputy and Council your pleasure. Chester, 18 Feb. Hol., pp. 2. Add. : Lord Cromwell, lord Privy Seal. Endd. Received his letter yesterday. 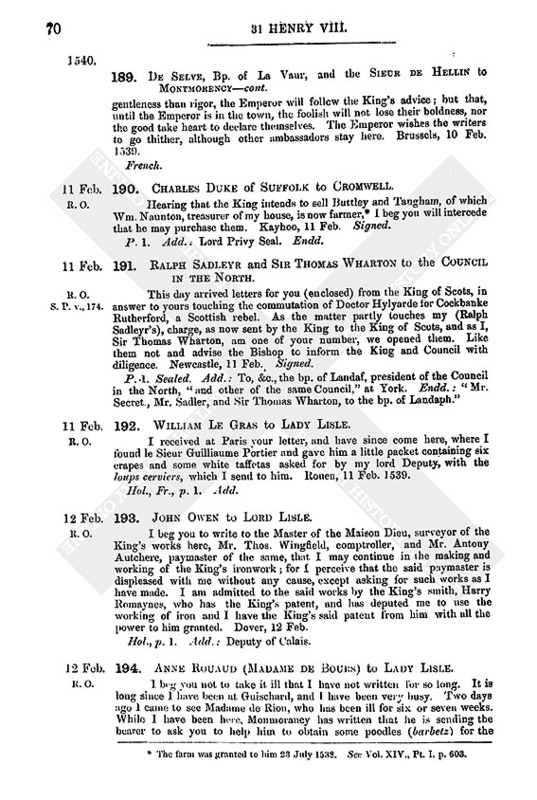 Norfolk arrived the day before, and was honourably received by the King. From what he has declared of his despatch, it is only for the purpose Marillac's cousin lately reported to the writer. Sends his said cousin back with money due for extraordinaries. The King makes very good cheer, and is come to visit his frontier to employ this season of peace in doing what is necessary there. Abbey of Cercamp, 18 Feb.
Norfolk will be able to leave in seven or eight days. The King will be very unwilling to take the way of which you wrote, for my brother's (fn. 11) affair, for it would be too prejudicial to him. French. Two modern transcripts, each p. 1. 229. Anne Basset to Lady Lisle. I have presented your “goodeneke” to the King, who likes it very well. As to your request, when he tasted it, that he would send you some token of remembrance that he liked it, “I told his Grace that your Ladyship was glad that ye could make anything that his Grace did like; and his Grace made me answer that a dyd thank you with all his heart.” He commanded me that Nich. Eehere should speak with my father Henege “afore a wenet; and whethyr a woll sende your Ladyshypp eny takyn by hym or no, I can nott tell; for Madame I dorst not be so bolde to move his Grase for hyt no nothyrwyse for fear lest how hys Grase wollde a takyt hyt.” Whereas you write that I should remember my sister, (fn. 12) I have spoken to the King for her; and the King told me that Mr. Bryan and others had spoken to him for their friends. “But he sayd a wolde nott grant me nor them as yte, for hys grase sayd that a wollde have them that showlde be fayre and as he thoght mett for the rome.” Wishes her mother to write to her friends to preys it. Does not dare speak to the King, as her mother wishes, for my Lord's matter “and for bery hys so~m' (? ).” My sister Katharine desires her commendations, and begs to be excused for not writing, for she is gone this day with my lord and lady of Rutland to Bevyr. “And wher as ye doo wrytt to me that I do not writt with my owne hande, the truthe is that I cane not wrytt nothyng myselfe but myn owne name, and as for that when I hade haste to goupp to the Quime chamyr my man dyd wrytt hyt wyche dyd wrytt me letter.” York Place, 19 Feb. Signed. Pp. 2. Add. : My lady Viscountess Lisle, at Calais. 230. John Husee to Lord Lisle. I have received your letter by Jas. Robertz. I have done my best for the despatch of your bill to be signed for the Friars, which my lord Privy Seal promises from day to day. Where you desire me to look for no more good “owres,” stating that you mean to send over my Lady to sue to the King for this and other matters, I will move Mr. Hoby no further. I will write to Mr. Wyndsor your pleasure for the 50 quarters wheat. I find Mr. Bryan is not very willing to part from Mr. George, nor Mr. George from him; and Mr. Bryan stays him here till your pleasure be known, though both your Lordship and my Lady sent him word, he says, to send Mr. George over to you. Mr. Basset is long ere this with the earl of Bridgewater. I doubt not he will only offer 500 or 600 marks, though the Earl asked 2,000 marks; who will, I think, cut off a great part of it. “And where your Lordship layeth to my charge that I do hear words spoken against you, and suffer them, I witness God that I never heard William Stephens, nor any of the other say anything concerning your Lordship, nor yet Adams (fn. 13) mentioned or spoken of.” As I have several times written, they never speak to me, but hate me like the pestilence. I am sorry you should suspect me, as I never dissembled with you yet. I send your gelding by this bearer, Nic. Eyer. Sir John Dudley promises to send an answer to your last letter in a day or two. London, 20 Feb.
231. Melanchthon to Henry VIII. In favour of the bearer Michael of Leipsic, a very excellent maker of mirrors, who is going to show his work to the King. Commences by comparing Henry, who alone among the kings of Europe favours letters and true philosophy, to Alexander, Ptolemy Philadelphus, Augustus, and M. Antoninus. Leipsic, 20 Feb. 1540. In commendation of the bp. of Limoges, the French ambassador at Rome. Hopes the Pope will think him worthy of promotion. Holyrood, 20 Feb. 1539. 1. The farm was granted to him 23 July 1538. See VoL XIV., Pt. I. p. 603. 2. See Vol. XIV., Part ii., No. 785. 4. Cromwell. See No. 290. 8. See Birks' letter of the 24th April following.